EAST VILLAGE — The owners of Maria's Community Bar in Bridgeport want to take over the shuttered Club Foot, bringing in a new concept tentatively called "The Golden Arms." But a local alderman wants the community to weigh in first, since the plan would need a liquor moratorium lift and zoning change. At the northeast corner of Augusta Boulevard and Honore Street, Club Foot closed in late November, just two weeks shy of its 20th anniversary. Club Foot's owner, Lauree Rohrig, who ran the bar with her husband, Chuck Uchida, said Monday that she would like to sell the business and liquor license to Mike Marszewski, owner of Maria's Community Bar, a tavern and packaged good store at 960 W. 31st St.
"There is a lot of red tape; I'm not holding my breath. The current buyer was an old customer. I would rather see him succeed there than another sports bar or bro-hole," Rohrig said. The plan to transfer ownership to Marszewski was unanimously supported by the seven members of the West Town Chamber of Commerce's board, said Kara Salgado, West Town Chamber of Commerce's Executive Director. "The team behind The Golden Arms has a great reputation and long respected history in the local hospitality field, and the Board of Directors believes this business will be an asset to the community and will contribute to the overall positive economic development in West Town," Salgado wrote in a letter to Ald. Joe Moreno (1st) last week. Mike Marszewski, Ed Marszewski's brother, is also part of the Maria's team but is not an owner. Ed Marszewski, director of the Public Media Institute, who also publishes an independent cultural magazine, Lumpen, did not respond to requests for comment, nor did Mike Marszewski. In an e-newsletter to chamber members on Friday, Salgado said The Golden Arms would feature classic cocktails, locally crafted beer and "community building activities." Drawing its name from a Nelson Algren novel, The Man with the Golden Arm, the new bar would be "taking its cue from the jazz era's Dil Pickle Club' and host an eclectic mix of conversations, readings, screenings, and performances that engage multiple communities from across the city," according to a proposal. The interior will feature "intimate, modular seating, vintage magic and mysticism posters, dark wood, cozy nooks and the original bar from the same era." On Monday, Dan Johnson, president of the East Village Association, an influential neighborhood group, declined to comment on what his group's stance is on the proposal to change the zoning to commercial use, to permit a tavern, and lift the tavern and packaged goods liquor moratorium. Several moratoria prohibit both new liquor stores and taverns on Ashland, Augusta, Damen, Cortez and more, according to a map. In April 2013, when lifting the ban for Garden Gourmet, after having also lifted the ban for a CVS, Moreno promised members of the East Village Association that he would agree to not support any more liquor establishments until the end of his current term in February 2015. 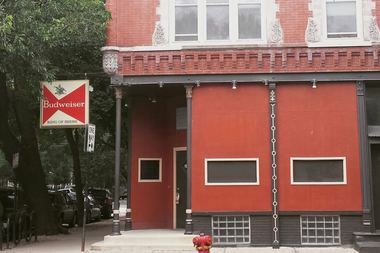 Moreno made exceptions to his promise for Forbidden Root, a craft brewery at 1746 W. Chicago Ave.
Johnson confirmed that the East Village's planning, preservation and development subcommittee had seen the proposal but could not comment because they wanted to send an official letter to The Golden Arms before talking with media. Salgado said that the restrictions on packaged good sales detract potential new businesses. "We feel like there is a vibe that people are scared off by these moratoriums, which are from older times. Now, aldermen can put in place plans of operations and there is the deleterious impact public nuisance ordinance," said Salgado, referring to additional ways to put checks on liquor licenses. Rohrig, who was originally going to let the bar's liquor license expire, said she decided to renew it at the request of her former landlord, building owner Scott Gray. Before Club Foot, Gray operated Lizard Lounge out of the spot. Gray was not able to be reached for comment. Raymond Valadez, a spokesman for Moreno, said Monday that it is his understanding that "the chamber will also be doing extensive, Web-based outreach to request community residents' feedback on the potential lifting of the moratorium in order to allow for a new tavern to be opened at the old Club Foot location." "During the next couple of months, we look forward to receiving the community's input regarding this new tavern proposal and whether the moratorium should be lifted to help accommodate a new tavern at 1824 W. Augusta Boulevard," Valadez said. Club Foot's closure followed other popular dive bars such as Marie's Rip Tide Lounge in Bucktown, which closed last August and Beachwood Inn, which shuttered in June.